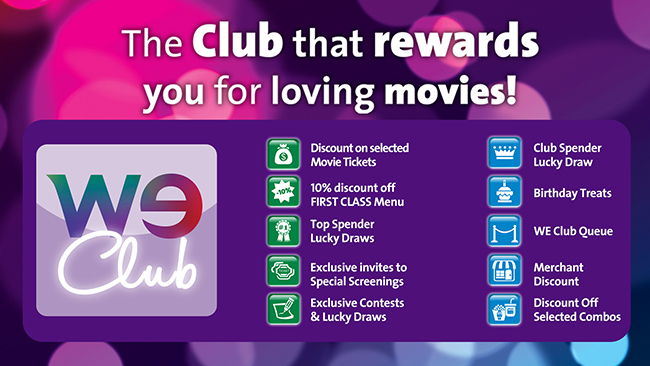 WE Club is the movie club that rewards you for loving movies. Singapore’s first customer loyalty programme for movies. Discover WE Club privileges. Get to track your transactions as well as participate in all online contests where you stand a chance to win prizes or exclusive movie premiums. Now you can enjoy your favourite movies at great value! WE Club members get to have exclusive discounts as part of the members' privilege. It's our way of rewarding you for loving movies with us. **$1 off standard 2D, 3D, and Dolby Atmos tickets. Applicable only for over-the-counter transactions. Wine and dine in FIRST CLASS and we'll offer a preferential price just for you. A movie dining experience in FIRST CLASS is extra special and WE Club members can be assured that we'll give you the best value too. Hey, big spender! As a WE Club member, we'll be able to reward you when you spend with us. With minimum $150 spend per month, you can be a winner of fantastic prizes. Additionally, it automatically grants you entry in the Club Spender lucky draw. You'll have bragging rights once you're winner of our Club Spender lucky draw. With minimum $800 spend in a year, you'll be in the running to win the grand Club Spender prize. Receive exclusive invites to movie premieres, events and special screenings. That's just one of the perks of being a WE Club member. There are a host of opportunities to enter movie contests and lucky draws to win fantastic prizes with WE Club. These exclusive contests and lucky draws mean rewards are endless when catching your favourite films at WE Cinemas. Enjoy an action-packed birthday month on us with promotions, offers and entitlements because if it's your special day, we want to celebrate it with you. Skip to the head of the line with a members-only privilege, the WE Club Queue, where you don't have to wait in line with the rest at special events because we've saved a special privilege just for you. Love it or hate it, have your say and be heard. Get to be a movie critic on our website and we'll put your voice out there. Realise the possibilities of being a WE Club member. The privileges don't just stop at WE Cinemas. We work with partners so that WE Club members are rewarded even beyond our doors. Make your movie experience even more special with our Personalised Movie Gift Cards. With WE Club, enjoy 10% off your personalised order. Looking to celebrate with friends and family? We'll render our personal assistance to ensure smooth coordination and effortless event-planning. Hungry for more? Benefits to being a WE Club member include discounts on selected munchies at our cinemas. *Valid for counter sales only. Not valid for eve of public holidays and public holidays.